let you get to the fun faster and with less mess. These mixes are so easy (and fun) to make that even your kids will want to get in on the action. Simply add water to the dessert mix, shake, and pour into your favorite baking pan. In a matter of minutes you and your family can enjoy that same taste you love, in a fraction of time. Fun is just a shake away! The kiddos and I loved these! Just add water shake and pour in the baking pans! 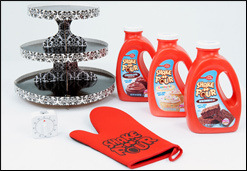 With Shake -N- Pour desserts, you'll get more time to enjoy that same taste you love, in a fraction of the time! The kiddos liked the Shake and pour Brownies the best! Giveaway~ Thanks to MyBlogSpark I can offer 1 reader of Dnbuster's Place the same gift pack I received! To enter to win please use the raffle copter form below. Giveaway will end 9/20. disclosure~ gift pack, information, and additional sample have all been provided by Betty Crocker through MyBlogSpark. I would love to try the Chocolate Brownie! Muffins. If these are considered muffins, maybe I can convince my wife to let me eat these for breakfast. I want to try the Confetti cupcake/muffin!! I want to try them all, but I'd most like to try the chocolate brownie!